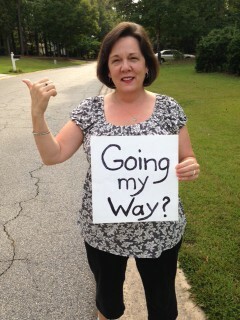 Hitch Hiking is Always an Option! One of the most difficult challenges for people with vision loss is finding reliable and affordable transportation. Whether you have had to give up your driver’s license or never had the chance to drive, it is an adjustment fraught with emotion and a sense of loss of independence. In this mobile, fast paced, car-loving society, who among us has not longed to get into a car and drive? Oh the joy of running errands on your own schedule or simply being able to spontaneously meet a friend for lunch. Those days are long gone for me; I lost my driver’s license 24 years ago due to vision loss. It was a real game-changer to be sure. However, life can be lived even after this happens. Life without a license to drive calls for innovation, networking, and advocating for yourself especially if you live in a community that does not offer public transportation. At the time I lost my license, we lived in the cornfields of rural Indiana. My husband and I quickly realized this location was not going to work for us; we had three young children to raise and I had a career I wanted to pursue. So, we relocated to Georgia. We discovered Peachtree City which is in a rural county south of Atlanta. While it does not offer any forms of public transportation, it has 100 miles of golf cart paths and walking trails that connect the whole city. For years, I drove a golf cart to work, school, shopping, piano lessons, ball games and anywhere my busy life required. As my vision declined, my children were old enough to drive me and we survived a few more years on the golf cart paths. Then my kids got their drivers’ licenses and we bought a second car. They each took turns being my chauffer. Before long, they all left for college and I found myself looking for new transportation options. I got my first guide dog and began to walk to work and to the closest stores. But there are many places I cannot get to on foot and there are still no buses in town. So I had to get creative and assertive about finding rides. I rode to work for a while with a neighbor who worked at the same place I did. Then her job changed and she moved. I then recruited college students from a local campus and several individuals as drivers for pay. We would discuss the price up front, which I based on mileage reimbursement plus an hourly wage. To find drivers or rides, I advertised my need for transportation in the neighborhood newsletter. Also, I contacted the local Lion’s Club to explore options with their volunteers. Often, I can get errands done with friends who do not accept payment and I buy their lunch in return. When my children were young, I arranged carpools and rides for them in exchange for my babysitting services. It is important to plan your rides in advance, communicate clearly with your drivers, and organize your outings to make the most of the trip. Some people keep their vehicle and hire a personal driver. You may want to advertise locally, interview candidates carefully, do a background check, ask about their driving record, negotiate fees, and secure appropriate insurance coverage. This option involves other expenses such as car maintenance, registration and tags, insurance, and gas. If relocation is an option, consider areas where there is public transportation; fixed route buses, paratransit, and public transit. Look up the Walk Score (www.walkscore.com) of areas that may interest you to find the “walkability” of the community. Consult a realtor about the rising number of “live- work-play” communities (http://plannersweb.com/2013/09/a-place-to-live-work-and-play/) that offer the conveniences of city life with less stress, decreased need for driving, and a healthier walking lifestyle. Some communities offer a “voucher transportation program” through the senior services or community services center. These programs are subsidized by federal and local agencies to provide transportation for seniors and disabled adults. The rider buys a book of vouchers at a low cost and exchanges them with a certified driver at the time of service. The driver then cashes in the vouchers for a subsidized amount. Some local churches or community groups may have “volunteer” transportation programs that provide rides free of charge to qualified people. Local taxi companies may be willing to negotiate discounts for disabled passengers who frequently use their services. There are new “rideshare” services cropping up such as Uber (www.uber.com) and Lyft (www.lyft.com) in most major cities nationally. These services offer rides on demand within minutes in private vehicles, as taxi alternatives. They have mobile apps used to request the ride and handle fees electronically. Expect to pay for rides and budget accordingly. If you owned a car and drove, you would have a myriad of expenses to maintain your own transportation. Accessible and affordable transportation is in short supply in many communities. Federal and local governments struggle to maintain programs and find resources to meet the needs of low income, senior, and disabled citizens. Shortfalls in funding have resulted in cutbacks in services and routes, and even the folding of paratransit programs in some communities. People need rides to maintain employment, good health and quality of life, and engagement in the community. It is imperative for the visually impaired community to be pro-active in managing their transportation needs. Lack of transportation can lead to isolation, unemployment, loss of independence and even depression. We must take charge, self-advocate and be creative when it comes to addressing this area of our life. This entry was posted in Blog Topics, Employment, Life With a Guide Dog, My favorite resources, Traveling and tagged accessibility, adjustment to blindness, guide dog, Independence, non-driver, retinitis pigmentosa, transportation, vision impairment. Bookmark the permalink.